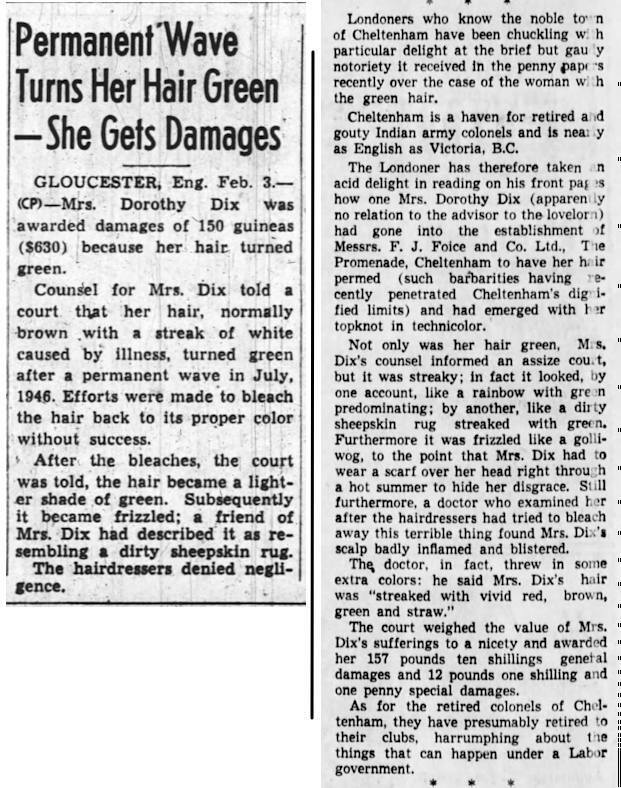 1948: Mrs. Dorothy Dix of Gloucester, England sued her hairdresser, complaining that after getting a permanent wave from them in July 1946, her normally brown hair turned green. 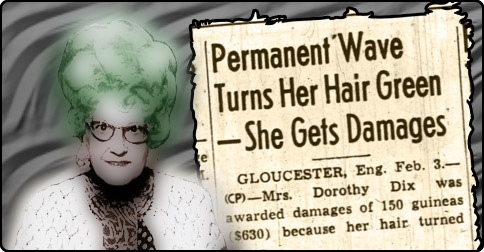 A subsequent effort to bleach her hair back to a normal color worsened the situation, causing it to turn a lighter shade of green, become frizzled, and blistering her scalp. In fact, her hair was not simply green. Various witnesses offered different descriptions of it, saying it was "like a rainbow with green predominating," "like a dirty sheepskin rug streaked with green," "frizzled like a golliwog," and "streaked with vivid red, brown, green and straw." The court awarded Mrs. Dix 157 pounds ten shillings in general damages and 12 pounds one shilling and one penny in special damages. Unfortunately, I haven't been able to find any photos of Mrs. Dix and her green hair. I had a cousin (blonde going brown) that this happened to back in the 50's. FUNNY stuff for a kid - not so funny when Jeannie lowered the boom. 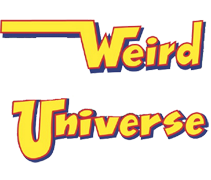 Wonder if this was the inspiration for "The Boy with Green Hair" (1948). Whoever wrote the article for the Winnipeg Tribune was a special sort - you don't see writing like that very often anymore. I agree, KDP, that's a gem of journalism! Expat, it's not just back then: I have a friend with white hair. She used one of those temporary rinses to color it fire-engine red for something (Valentine's Day, I think). That's when she discovered that "temporary" on normal hair is much less temporary on white hair. She said she went for quite a while looking like a matchstick. BTW, the damages awarded amount to about $7,500 these days. I remember my Mom mentioning that a home perm right after I was born (1950s) turned her red hair purple.